Free public parking available on Meridian Ave and Mission St. parking structure. 2-hour parking available on street. 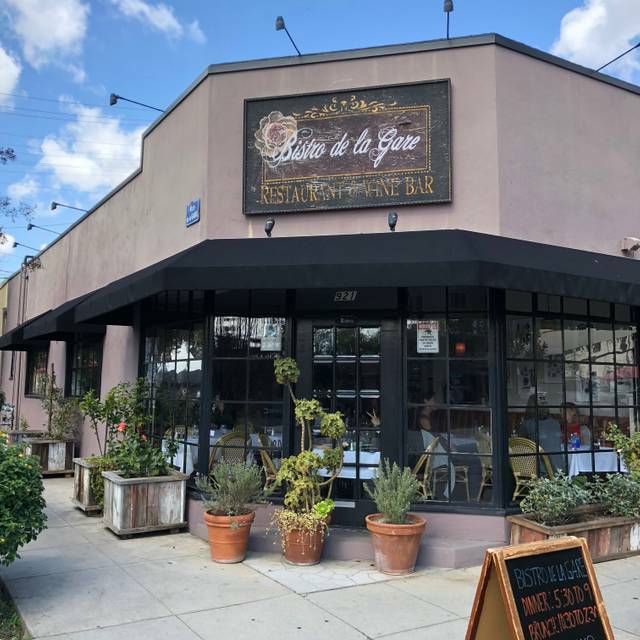 Under new ownership since August 2013, Chef Bruno and his team at Bistro de la Gare are dedicated to offering each of their guests an authentic French culinary experience, with an Italian flare. I ordered the terrine for appetizer and it tasted as bland as card board. My steak was over cooked instead of medium rare. The waitress came to our table sparingly. Over all it was a lousy experience!!!! Amazing service, Amazing food. Kudos to Lorena our server for an outstanding service. had heard very good things about the restaurant and came away impressed. success unless they have a meal at Bistro de la Gare. Wonderful chef, location, vaired selection of quality dishes and wines. Nice outdoor and indoor seating. Highly recommend. What a wonderful experience! Chef Bruno and his staff were so welcoming and attentive. Family dinner to celebrate mom's birthday - five of us ordered different entrees and each of us was delighted with our choice. Classic French dishes, with a few other "bistro" items. Hand-crafted cocktails - delicious too! Excellent quality; reasonably priced. 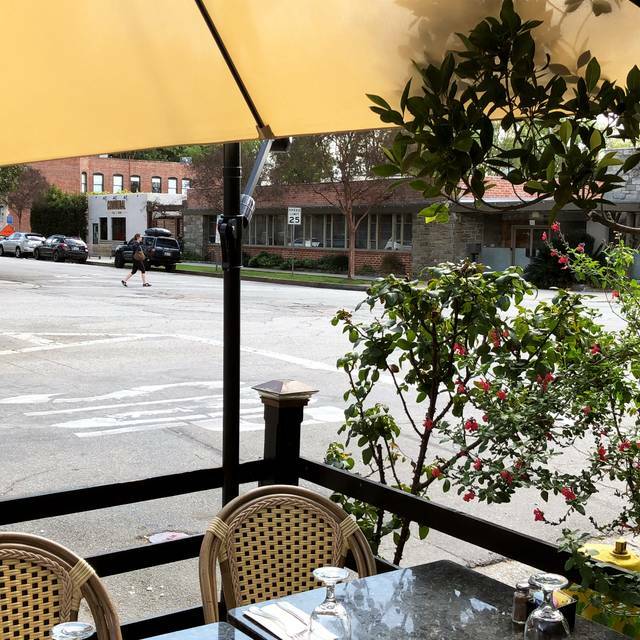 We had never been to the restaurant before but frequent South Pasadena for shopping. It was a great experience. Service was good and accommodating. Will never have mussels anywhere else again! Everyone loved their meals. Friend said best duck she has had! 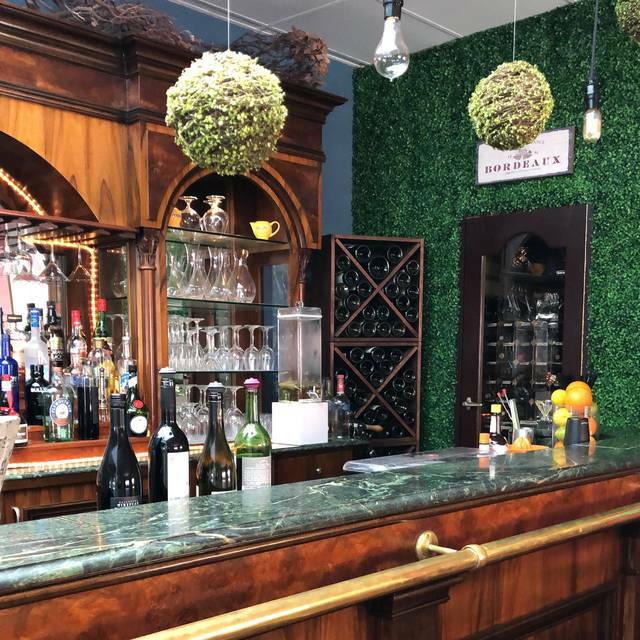 Drinks were “spot on” and ample pours. We all look forward to returning soon. We appreciated that they made the escargot when it was not on the menu that day. We thoroughly enjoyed each of our (4) main dishes, and the three desserts that we shared. 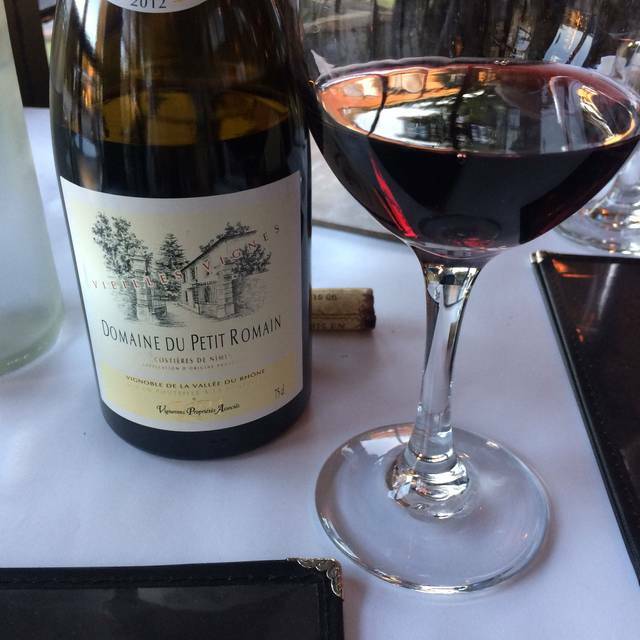 Although the wine list is not massive, it offers plenty of excellent choices. We have followed this restaurant since they were located on Colorado in Eagle Rock. Unfortunately, our past brunch experience was subpar and disappointing for our group. The ambience was beautiful but service and food value are equally important. Cozy and romantic with great food. Perfect for dates night. Reservation change via open table wasn’t updated on their records and they were a bit put out. Service a little slow for us but we were watching the clock for an after dinner event. We’ve eaten there several times. 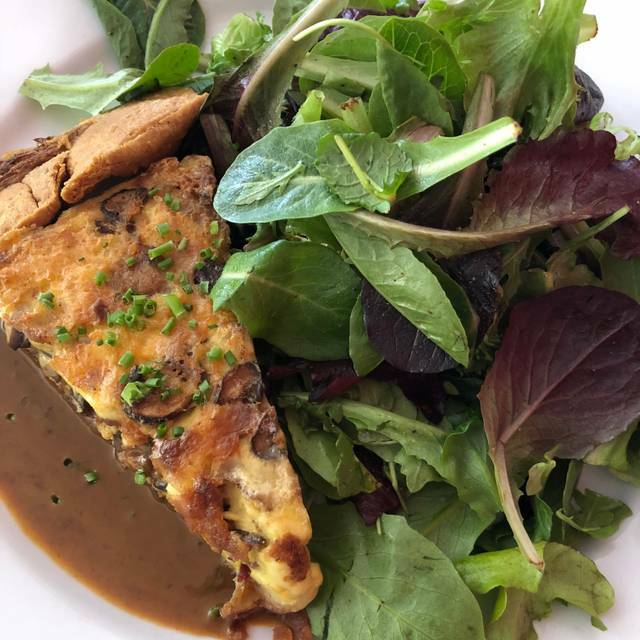 Excellent “relaxed” French food at a reasonable price. Convenient street parking. This is our go to special occasion restaurant, but this time we were extremely disappointed; delicious food, but very poor service. I specifically requested a booth at the time of reservation (due to back issues), but did not receive one. The hostess was less than apologetic and was unconcerned. We waited at least 15 minutes before a waitress came over to take our order; and she appeared only because I asked a server to please send one. The waitress was pleasant and apologetic, but stressed. My husband ordered duck breast. When later on, I overheard from another table that the kitchen was out of duck breast, I asked our waitress if this was true. She assured us that our order was in time and it would be served, only to come back later and tell us that the kitchen ran out. My husband had to put in another order, which further delayed our meal. We waited almost an hour for our main course; she apologized and told us the kitchen was backed up. No apologies from a manager, no offer of a drink or a dessert to make up for such poor service. I love their food and the ambience, but the service needs to improve, especially for the prices they charge. We will give them another chance; we will book earlier in the evening and I will call and personally ask the manager for a booth! If this doesn't work, we will have to defect to the Raymond! Food and wine selection was excellent. Dining room is a little noisy. Highly recommend eating there. Took my Grandma here for her birthday. She LOVED it!!! She has been to France many times and says it's the most authentic place she's been to stateside. Our server was a delight and without even having to ask brought dessert out with a candle and sang happy birthday with us. Just a delightful experience. Went for Sunday brunch. Really enjoyed the ambience. Had eggs Benedict and Brioche French toast... both delicious. The very French chef even came out to ask us how our meal was!! We visit the restaurant on an occasional basis and have always enjoyed it, however New Years Eve was an exception. Our reservation was at 8:15 an upon arrival we learned that they were offering only a 4 course $90 price fixe dinner. I ordered the mushroom soup which surprisingly was served in a shot glass, endive salad which was excellent, prime rib which they had run out of and baked Alaska. When one viewed the menu it was easy to understand why the prime rib sold it for it was the outstanding entree. The service left a lot to be desired, was slow and the server was confused at times. To add insult to injury I was charged $5 for a plate of bread. I've eaten at the Bistro several times over the last ten years and have enjoyed it. This year I took my date on New Years Eve. I had reviewed the menu on line and had decided to order the prime rib for $26. Made reservation without knowing that Christmas Eve is serving set menu only. Food and service was very good, but a little of a sticker shock of the price and the quantity of food served. Maybe one more course to the $90 menu would have gain more value score. A lovely Christmas Eve dinner, perfect planning of the menu, delicious for every course. Always have a great time! Absolutely beautifully cooked food as always. We will come again. A wonderful evening with delicious food. 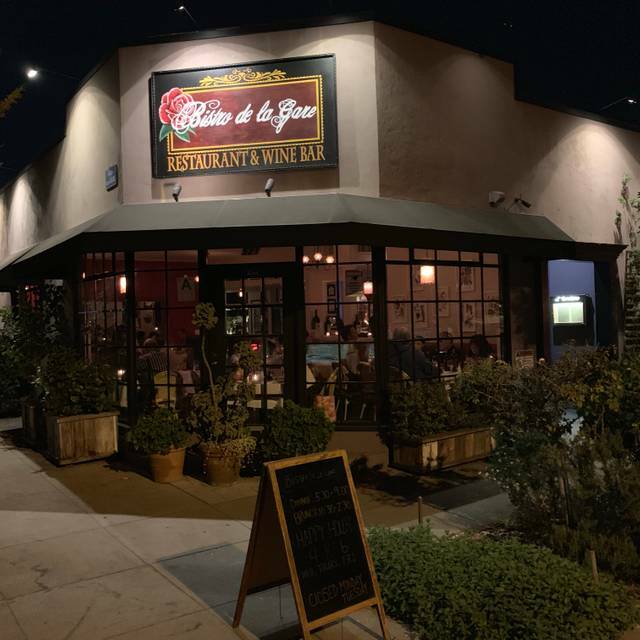 This is a smaller neighborhood restaurant that is elegant enough for a special dinner but casual enough for a friends or family outing. Service was attentive and charming. I love this place! Overall, I thought the evening was great. 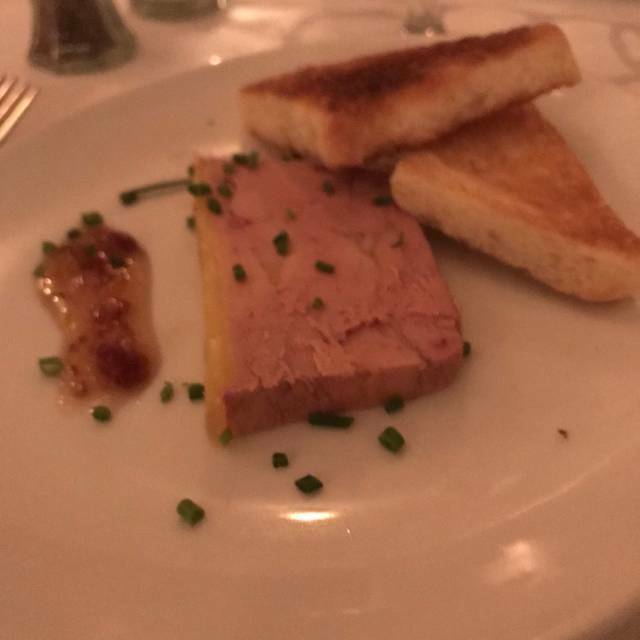 The foie gras was good, but overpriced for the quantity received. My aunt felt the French onion soup was too sweet, but she really enjoyed her filet mignon. I loved my duck confit. Cooked perfectly and the skin had the right amount of crispness. The potatoes and haricots verts were excellent as well. My meal was delicious; no complaints. My uncle enjoyed his magret de canard (duck breast), and my partner’s boneless lamb shank was fantastic. Dessert was sorbet (simple), crème brûlée (ordinaire), and chocolate mousse (homerun). I would definitely return and I would send friends here. Merci Chef Bruno! Very much like an authentic Paris restaurant! Excellent food and service! I had a pleasant anniversary dinner. Though we were waiting a long time to be seated, even after making a reservation. We sat at the bar waiting for a table, got some drinks. It took 15 minutes for the lady to do one simple cocktail. Even after another 15 minutes to get a second round. The other lady (bartender) didnt make our drinks, but the server. The cocktails were over poured with syrup. At the end it was worth the wait because the food was amazingly delicious! Really wanted to love this place but it was mixed reviews. Fantastic escargot but French onion soup was too sweet and cloying. Lobster ravioli and duck? Amazing. Simple salad Lyonnaise- way too much vinegar, over cooked egg and just poor. Service was good. And creme brûlée’s great. For the price point - expected more but could have just been an off night. Love the bistro feel - just hoping the dining experience will match the price tag. Service was good and attentive! Wonderful place! Friendly, delicious food! My favorite restaurant in Pasadena. The food was spectacular, service perfect and the ambiance is like being in a Bistro in Paris. Love this place, again and again.